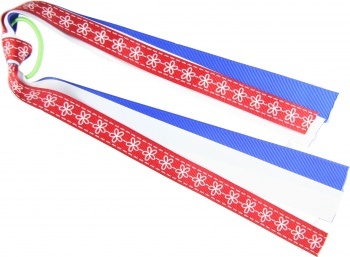 Three layers of grosgrain ribbon that are 9 inches long. The Red has white flowers and lines and is 5/8 inches wide. The white and blue grosgrain ribbons are 7/8 inches wide. All are wrapped around a ponytail holder in a French knot. Patriotic colors for all of our American Holidays.